The school term has come to a close. If you are thinking of what to do for the holiday to keep the little ones busy, stop!! DCK is offering its annual holiday workshops for 3 weeks in both July and August. The workshops will be an opportunity for the participants to learn different dance and movement disciplines. This allows the students to develop an interest in a specific discipline and develop a passion from then on. It will also be an opportunity for them to make new friends as they interact with children from other schools, cultures and countries. The program will include Gymnastics, Ballet, Musical Theatre, Hip Hop, African Dance and Arts and Crafts. It runs from 9:30 a.m. – 12:30 p.m. from Monday- Friday. 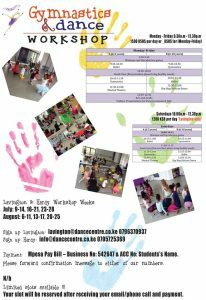 On Saturdays in Lavington from 10.00-12.30. Call 0705725369 Hardy Studio or 0796370937 Lavington Studio to book your space. Workshops slots are limited and running out fast. Tuesday & Thursday 5.00-6.00 Contemporary. Charges: 1000 per class or 8000 for 10 classes. Looking forward to having you with us over the holiday.